Dealing with the Securities and Exchange Commission is a complicated area for companies and their counsel, particularly in the years since the 2008-2009 financial crisis. Many changing laws and compliance requirements mean that attorneys must be alert and work diligently in order to keep up with the current legal environment. In SEC Compliance Best Practices, expert lawyers offer guidance on the various regulations and latest trends, including the emphasis on municipal securities, the expansion of regulatory authority, and the need for compliance in new forms of fundraising, such as crowdfunding. The authors also discuss whistleblower protection, disclosure rules, and other aspects of SEC compliance that both lawyers and clients must understand. In addition, they analyze the increasing globalization of the securities industry and how political landscapes in different countries affect SEC regulations. 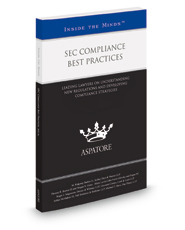 For anyone who frequently works in the securities industry, SEC Compliance Best Practices is a valuable tool for learning the ins and outs of this complex and shifting landscape.